› Author Affiliations Funding This project was supported by the Hamilton Health Sciences New Investigator Fund. Clinical Trial Registration Unique identifier: NCT03005704 (URL: https://clinicaltrials.gov/ct2/show/NCT03005704). Background Ticagrelor is an anti-platelet agent that is indicated for prevention of thrombosis after acute coronary syndrome or intra-coronary artery stent implantation, but it increases the risk of bleeding. Platelet transfusion has the potential to treat or prevent bleeding in patients taking ticagrelor, but the optimal quantity of platelets and timing of administration have not been fully defined. Methods and Results Ten healthy subjects took ticagrelor in combination with acetylsalicylic acid for 5 days, and had blood collected prior to treatment and at 2, 10, 24, 48, 72 and 96 hours after the last doses. 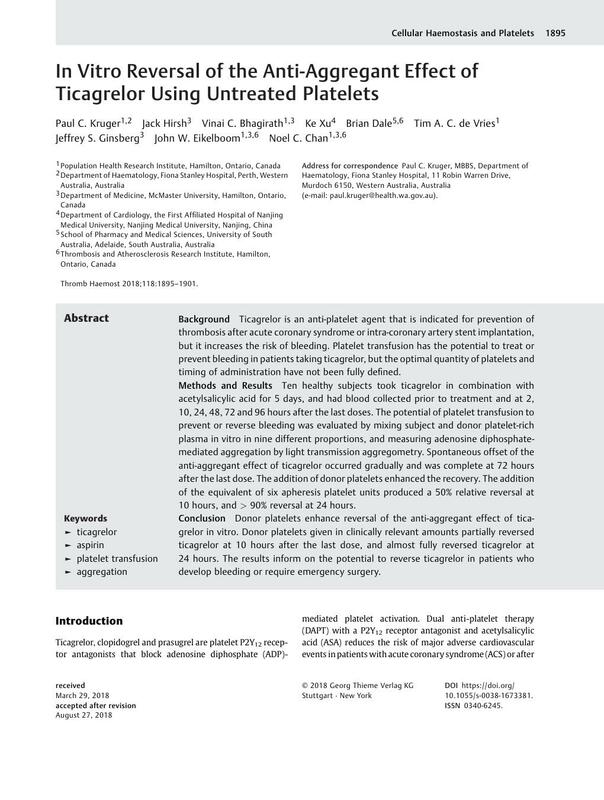 The potential of platelet transfusion to prevent or reverse bleeding was evaluated by mixing subject and donor platelet-rich plasma in vitro in nine different proportions, and measuring adenosine diphosphate-mediated aggregation by light transmission aggregometry. Spontaneous offset of the anti-aggregant effect of ticagrelor occurred gradually and was complete at 72 hours after the last dose. The addition of donor platelets enhanced the recovery. The addition of the equivalent of six apheresis platelet units produced a 50% relative reversal at 10 hours, and > 90% reversal at 24 hours. Conclusion Donor platelets enhance reversal of the anti-aggregant effect of ticagrelor in vitro. Donor platelets given in clinically relevant amounts partially reversed ticagrelor at 10 hours after the last dose, and almost fully reversed ticagrelor at 24 hours. The results inform on the potential to reverse ticagrelor in patients who develop bleeding or require emergency surgery.